Boxboard, Box Board, Core Boxboard, Strawboard, Straw Board; What is it in the Art Supplies Industry? Boxboard is often referred to as strawboard or core boxboard in the craft and art supplies industry. It has a thousand and one uses, well as many as you can put your mind to. Boxboard is a fairly rigid cardstock, depending on what weight you are looking at. It is a natural looking light grey colour due to the fact it is made from recycled fibres. Isn’t it great when we have a product that is 100% made from post consumer recycled waste? That’s an art within its self. Boxboard is an art supplies favoured by book binders, journal makers, framers, stencil cutters and is also used frequently for packaging. It is popular among architectures and model makers to make scale models out of too as it can be cut and scored fairly easily with a good quality sharp utility or craft knife. Straw board can be painted and decorated with acrylic paints, markers (paint markers are the best to use such as Montana or Posca) and spray paint however we do recommend that you gesso the board first so that your colours sit on top of the card surface rather than being absorbed into it. This way your colours will POP making your colours brighter. If you are using box board for book or journal covers, jac paper is the perfect adhesive. It will allow you to glue other cardstocks, papers or even fabric to the board with no air bubbles, corner to corner will be glued and it is instant. Strawboard is available in a range of weights that can be confusing sometimes. So here is a little list for you; 490gsm equates to 800um, 595gsm - 1000um, 690gsm - 1200um, 890gsm1500um, 1100gsm – 1800um, 1440gsm – 2400um, 1780gsm – 3000um. With varying weights also comes a range of standard sizes such as a4, a3 and so on. If you can’t find specific sizes please let us know as we are able to customise weights and sizes for you. 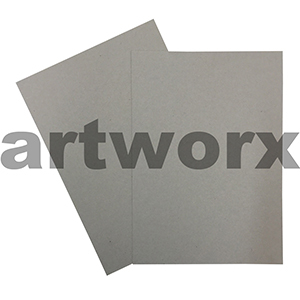 For example if you need 1000 a4 490gsm sheets for picture frame backing for a large presentation. We can look after you and when you are buying in bulk wholesale prices apply. As a team of artists and crafters we endorse all our products as we work with them ourselves personally and in our studios. If you have a question, just ask and we will endeavour to find the answer for you. When checking out with any of your art and craft supplies don’t forget to peruse our artist VIP membership for unbeatable prices and up to date information on all of our art classes and workshops with artists we fly in from all over Australia.